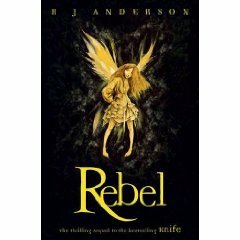 ‘Rebel’ is a sequel to ‘Knife’; a best selling children’s and young adult’s book. It is a book that grips you from its opening line; ‘the Queen is dying’ through to the end, with many twists and turns captured between the pages. Set in the modern world, the story is of a young faery named Linden, who discovers she is the only one who can save their dying folk, the Oakenfolk, and is sent on a quest by the Queen to find more faeries to help them. The tale harks back to an old legend of theirs, which states that their magic has gone due to a curse (the Sundering) placed upon them centuries ago by the evil faery Jasmine. To save her folk, Linden must win over help from other faeries to restore their magic and save their beloved tree the Oak, with borrowed magic from the Queen, to which she has never used before. With help from her human friend Timothy (who has been sent to live with Paul and Peri on a suspension from school), his human cousin Paul and his wife, and ex faery Peri (previously named Knife), this novel follows Linden as she tries to seek out other faery folk. As this is a sequel, at times it can be hard to follow if you have not read its predecessor, as it relates a lot to ‘Knife’, making it either a little confusing to follow, or you have to ignore some bits as they do not fit in. Therefore a recommendation of reading the previous book is a good idea. It is a well written book, that captures the idea of faeries actually existing in our world very well, and the storyline keeps you wanting to read until the end. The adventure Linden goes on with her human friend Timothy is exciting and thrilling, as well as their revelations they discover along the way. Moments within ‘Rebel’ have you reading on without wanting to stop in sheer excitement, just to find out what happens next, whilst others have you longing to find out what will happen next. A marvellous book you will love to read again and again, no doubt. This book dislodges every idea you ever had of faeries, they are not the small, cute or necessarily kind creatures you find at the bottom of your garden, they are instead mischievous, sometimes cruel and powerful in skills and often use humans to their advantage. Humans are the ones to be feared, not faeries. Humans could lock them away and scientifically experiment on them, and yet faeries steal our creativity as they have none, and make it into their own. But who is worse than whom? Faeries too are brave and the Oakenfolk have learned to adapt to the world with no magic, enhancing hunting skills, mainly through Peri who still hunts for food in her human form, and yet they are a little naive, in the case of Linden’s reliability upon Timothy. I would recommend this book for those aged eleven and up, including adults, as it is an enjoyable book to read. The language is accessible, making it great for this age range. This is definitely a book recommended for those with a sense of adventure, discovering the unknown, and discovering depths of the world that just might exist. What an extraordinary tale Knife is - this is a different take on Faeries at the bottom of the garden.